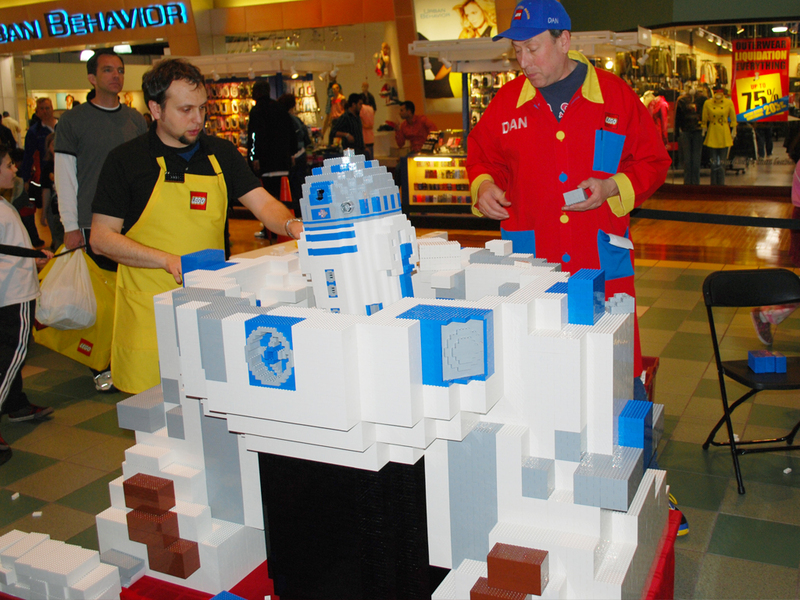 This past Saturday (March 28), in celebration of my Christopher recently turning 7, my wife and I and both boys trekked down to our nearest LEGO store, which is 2 hours away. 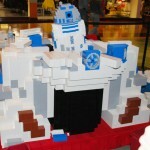 Christopher’s birthday was actually two weeks ago, but we timed our trip to coincide with the appearance of a LEGO Master Builder and the opportunity to help take part (along with hundreds of children & “grown-up children”) in building an 8-foot tall R2-D2 sculpture at Discover Mills Mall in Lawrenceville, Georgia. 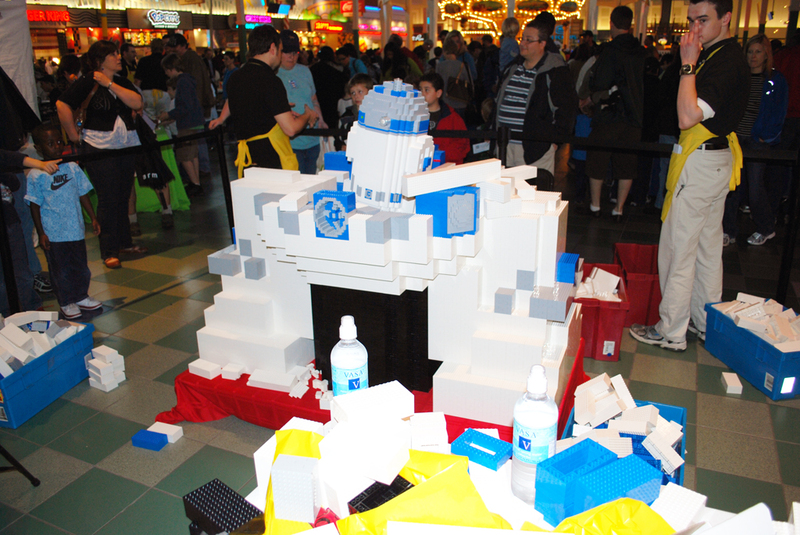 The actual building event took place in an opened area at the food court. 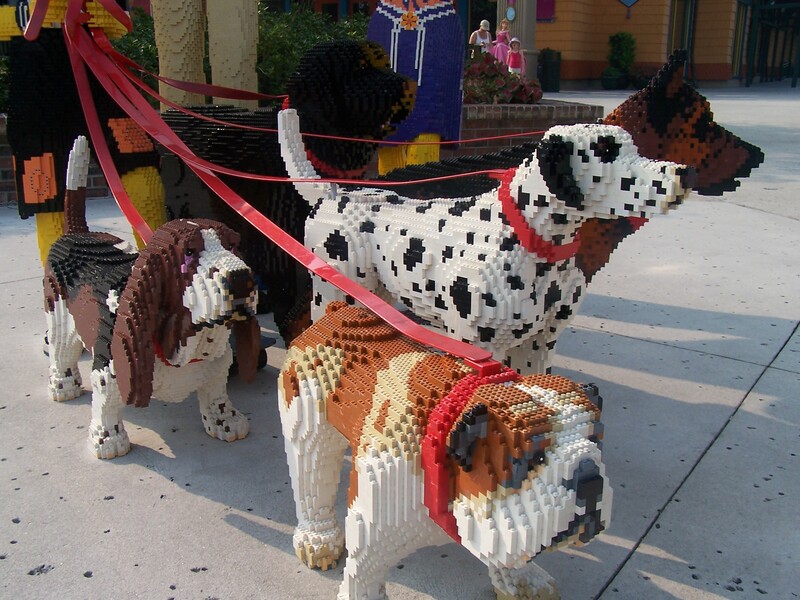 Good idea since there were literally hundreds of people there that day taking part in the event. 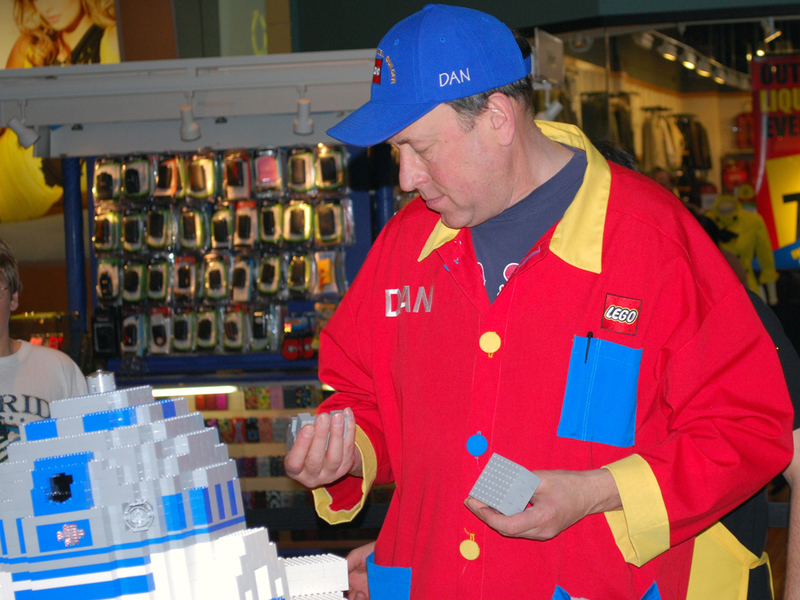 There were a lot of people at the LEGO store, too, partly since participating in the event got you a $5 off coupon any purchase over $35. 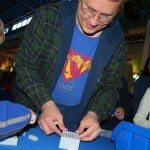 Here is the Master Builder for our event, Dan Steininger. 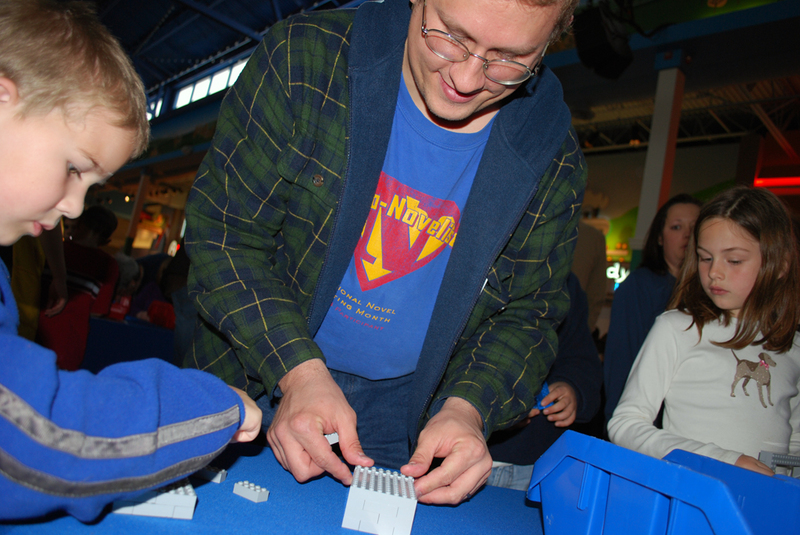 He had quite a few helpers. 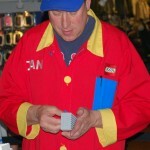 There were usually 1 or 2 guys behind “the fence” with him answering questions and taking completed 4x bricks. 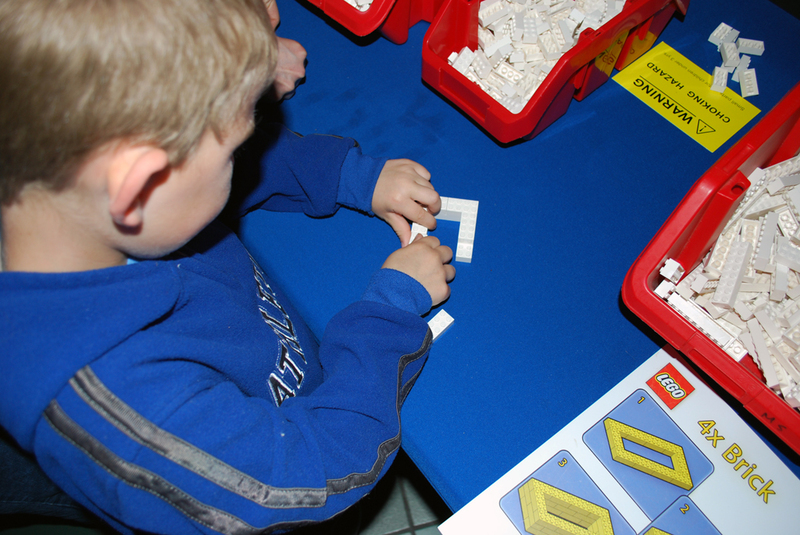 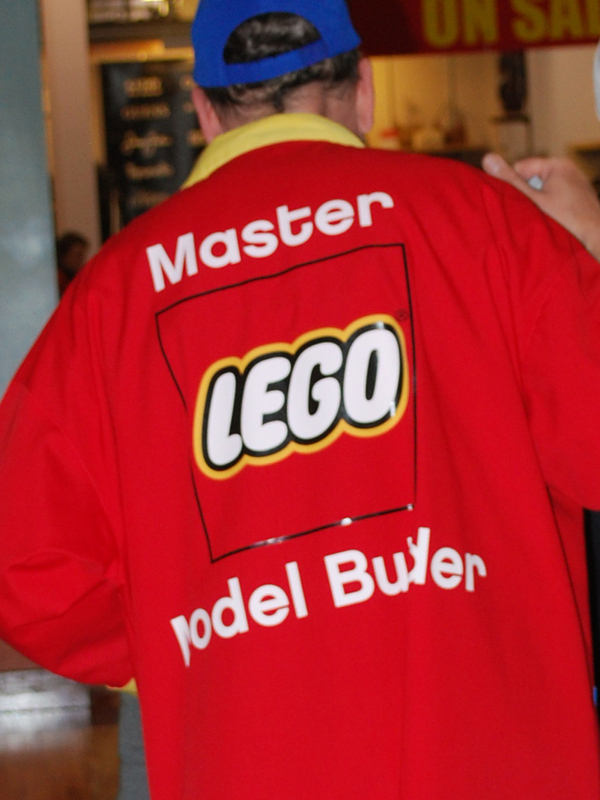 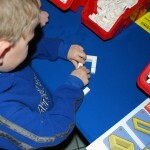 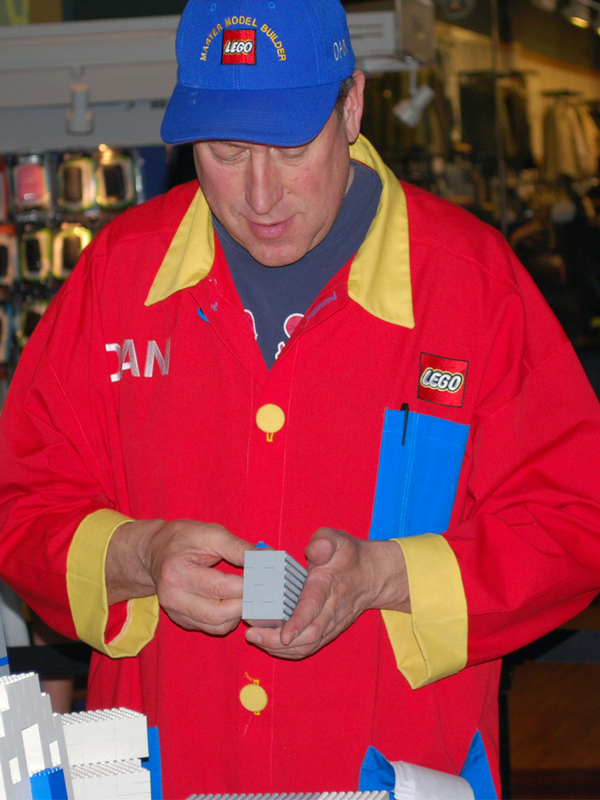 In the meantime you had about a dozen extra LEGO store attendants on-hand assisting the Master Builder, refilling brick tubs on the tables, answering questions, keeping things flowing at the store itself, etc., etc. 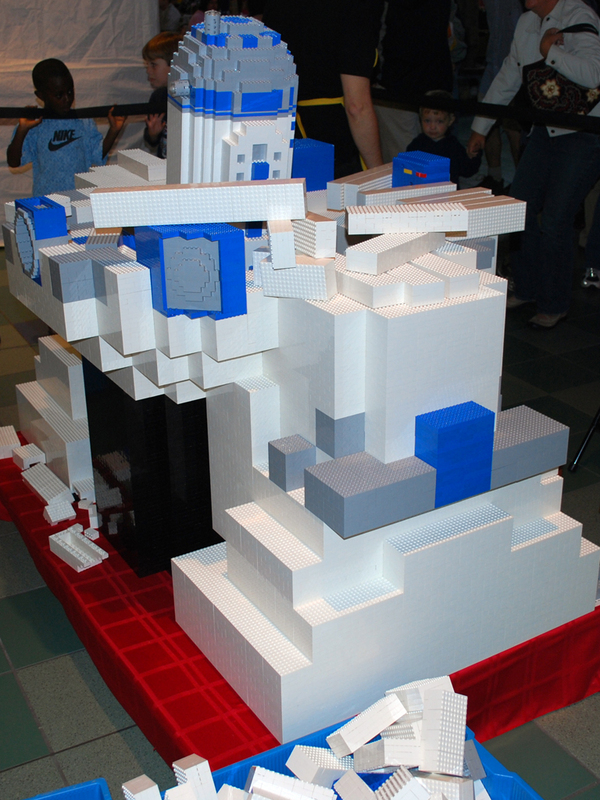 Dan the Master Builder had a smaller model of R2-D2 that he has made that he used as his “instructions.” The basic idea is that each brick in the small model will end up being one of the 4x bricks in the big sculpture. 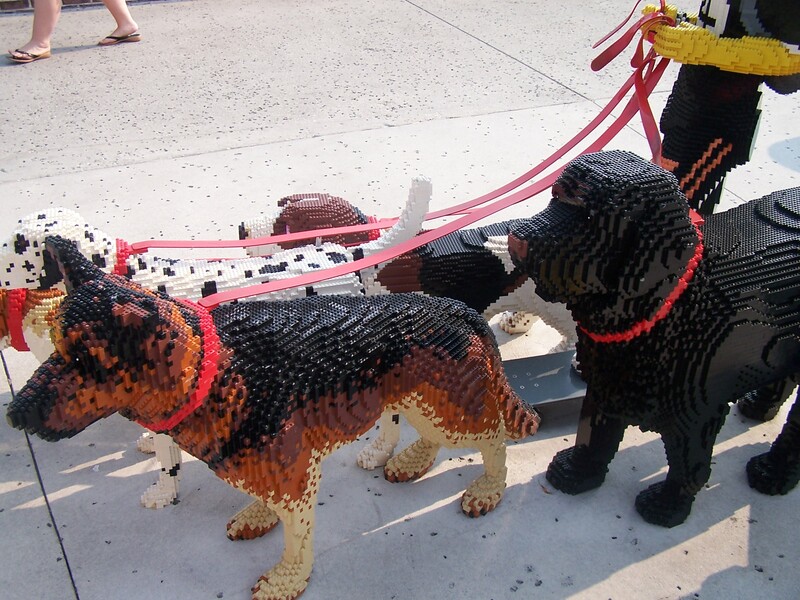 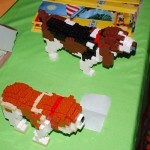 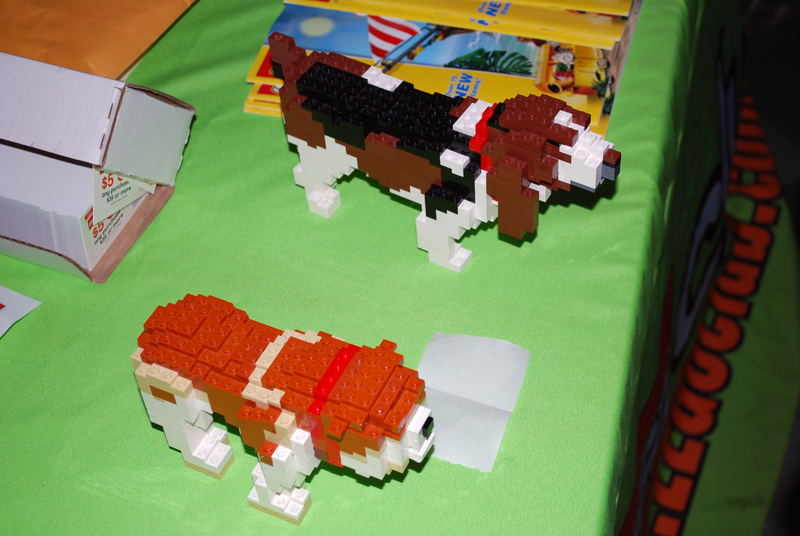 Dan also had some “instructions” for some dogs he’d built. 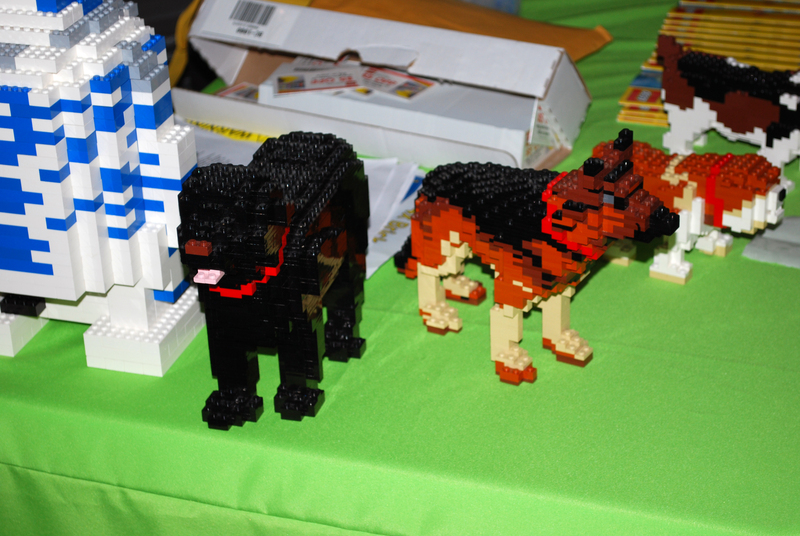 I was pretty excited to see them because these are the ones that I’ve personally seen and photographed outside the LEGO store at Downtown Disney in Orlando, Florida. 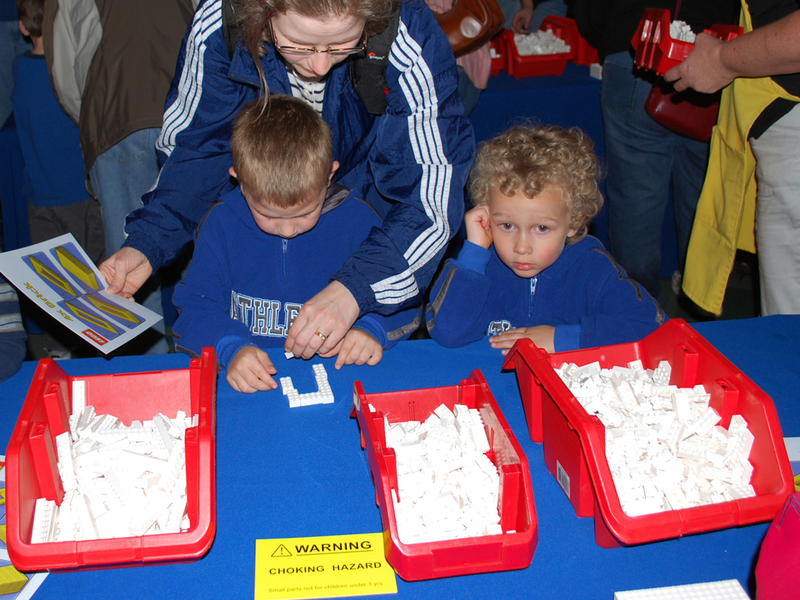 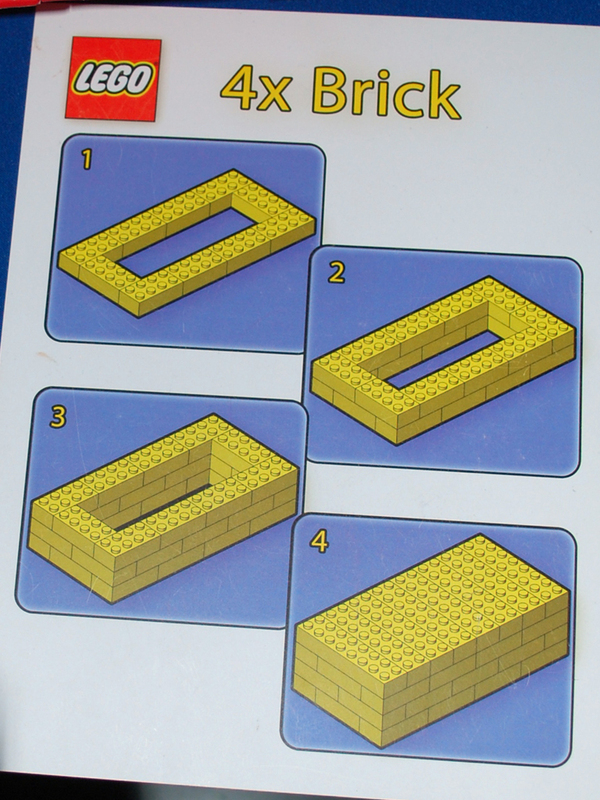 For the building process there were about 8 tables set up with bins of bricks and the instructions to make the 4x bricks. 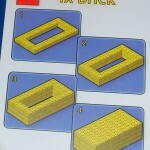 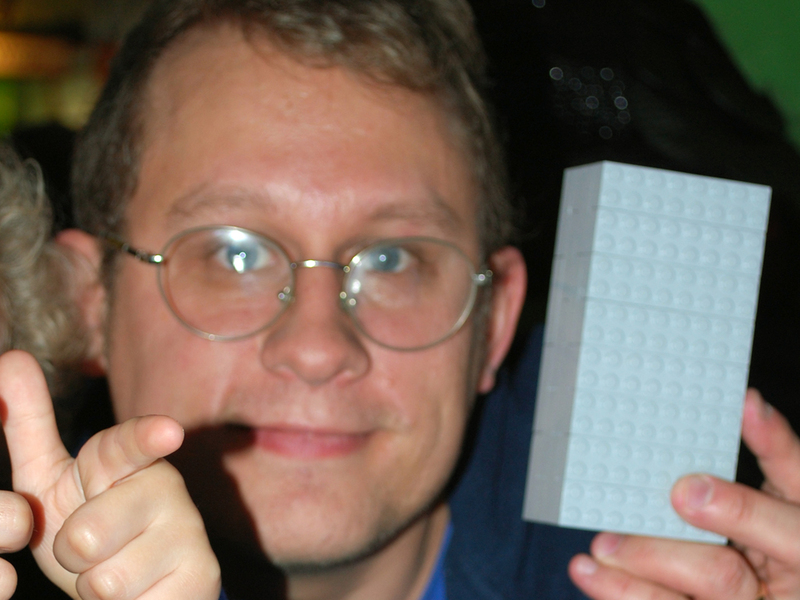 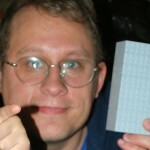 The 4x bricks were pretty straight forward: 2 layers of 2×4 bricks, then a top layer of 2×8’s. 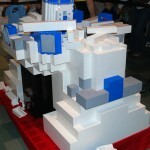 There were a couple tables each for white, grey, and blue, the 3 main colors of the sculpture. 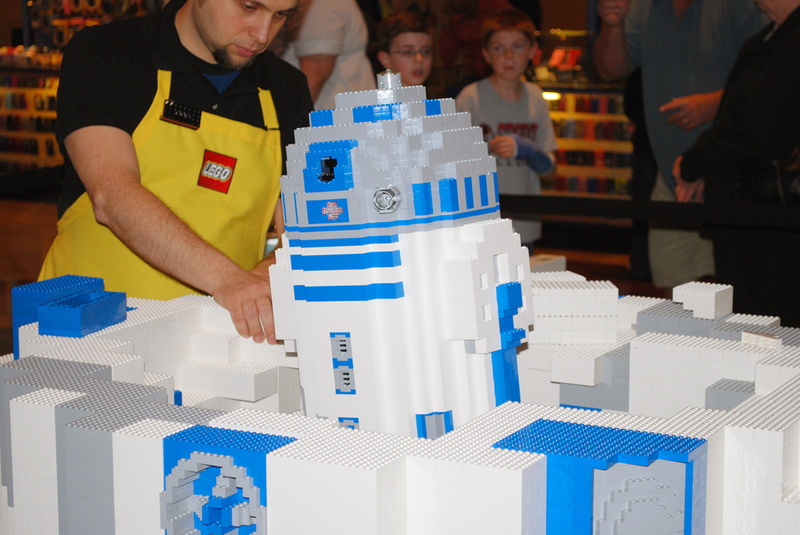 Once you were done with however many 4x bricks you decided to make, you took them to the Master Builder, or to another attendant. 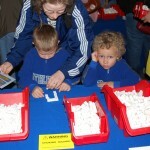 In return you got a $5 coupon and a slip of paper to take back to the LEGO store to get your participation certificate. 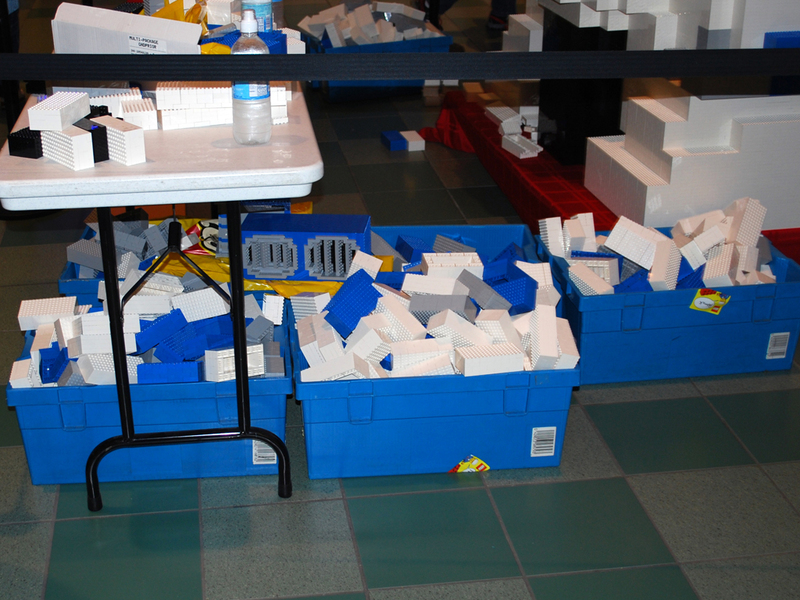 Despite it being busy, the event seemed very well planned … most, if not all of that LEGO store’s employees seemed to be there to help guide folks through the build, answer questions, and get you through the long line in the LEGO store itself. 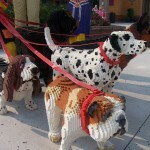 Despite the long line, it was moving quickly, and the personnel were very professional and helpful. 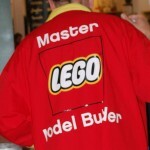 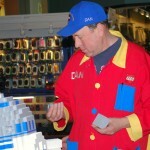 It was nice to see at least 4 store employees we remembered from our trip to the LEGO store last year. 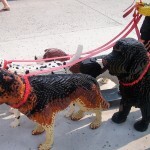 Since we only were able to be there on Saturday, we didn’t get to see the finished sculpture, so I don’t have a final photo. 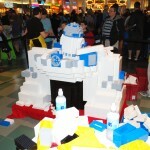 So if anyone else was there, or at another of the R2-D2 events and wants to send me a picture, I’d love to add it. 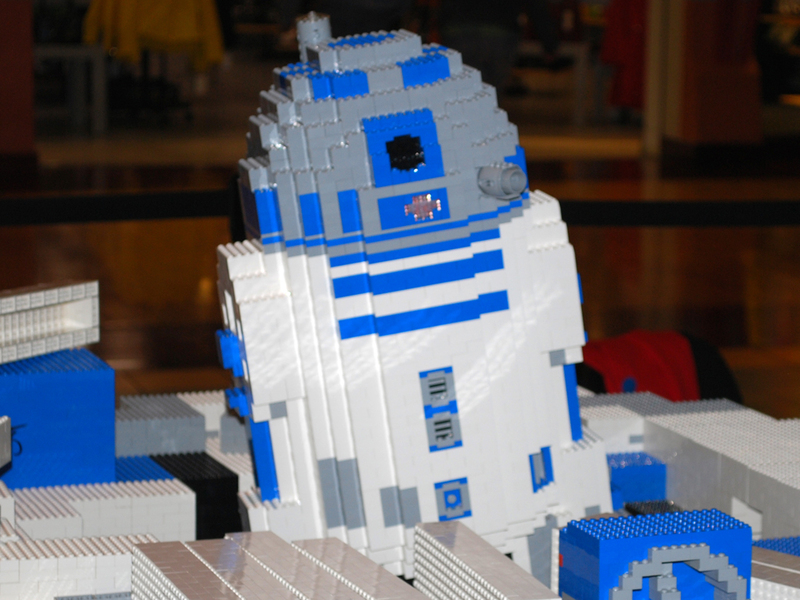 Dan said that after the event, the R2-D2 will get completely dismantled to be re-used for the next event. 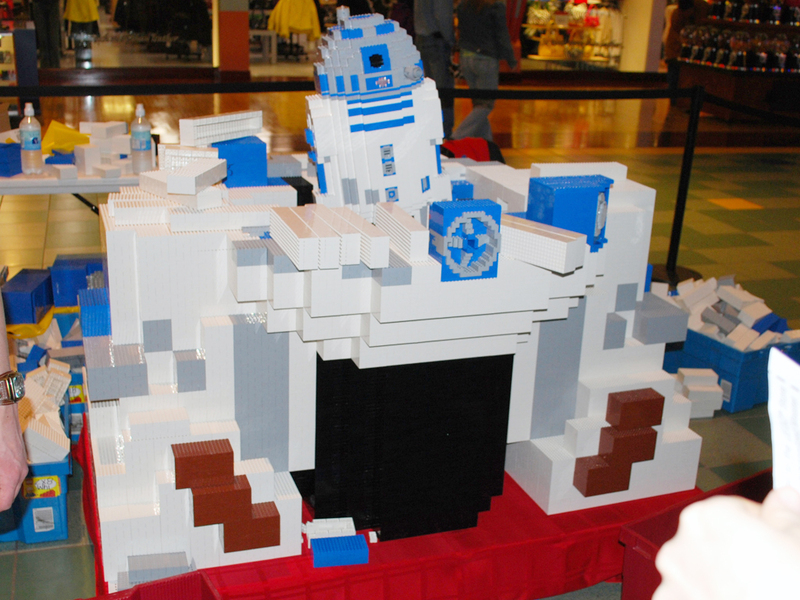 This one has already been built several times. 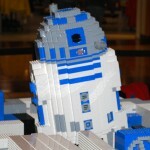 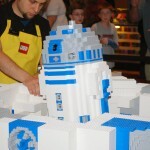 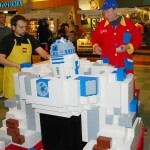 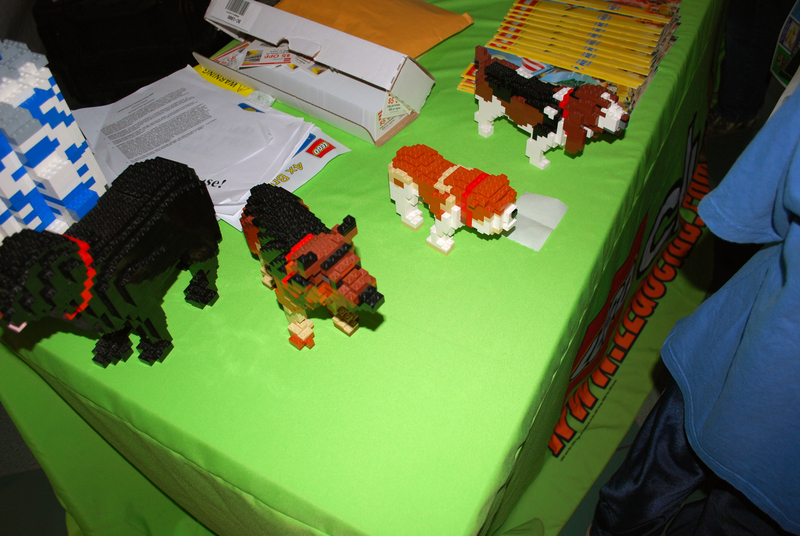 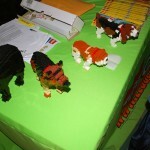 Check out LEGO’s events page for things going on at your local LEGO store. 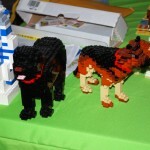 And check out more photos of the event at my Flickr Photstream.